"WOW, what a great club!" Every year more than 500+ students participate in a three-month training program to prepare to become orientation leaders. Orientation Leaders (OLs) learn how to be effective group leaders for new students and to help behind the scenes as Event Staff members during Soar and the Week of Welcome. Orientation Team spends six months learning how to be successful trainers for Leaders-in-Training (LITs), who may graduate from the training program and become OLs. Team members have been an OL at least once prior to their term. Orientation and Transition Board develops leadership training programs for the Team and the LITs, as well as putting together the pieces of Soar and WOW for new students and families with the help of the Team. Board members have been on the TEAM at least once prior to their term. WOW introduces the new students to the community and businesses around them. WOW gives students an opportunity to prepare for their classes and meet their advisors. WOW introduces new students to important issues they may encounter while at this university. WOW provides a social atmosphere in which new students will make lasting relationships at their new school. WOW allows new students to experience a taste of college life before classes actually begin. This program is made up of the most fun, random people you will ever meet. It also has this strange tendency to create lifelong friendships and, in some cases, romances between those who make it their own. Alumni who have experienced WOW and left San Luis Obispo long ago still pop by for a visit to Tuesday Night Spring Training Meetings and other special events. These are the Friends of WOW, or FOW. This program can be life-changing, to say the least. That's why many of us keep coming back for more. The text in these pages cannot explain this phenomenon. WOW can be a wonderful, fun, and exciting opportunity. It can create the best of friendships and can be an experience you never want to end. The only conditions are the ones you put on it. By being a member of this program you become WOW. You are part of its history and its future. In short, WOW will be everything you decide to make it. It is your program. Take some ownership in it. Make it yours. Make it fun. Week of Welcome history adapted from information provided by the University Archives, Cal Poly State University, San Luis Obispo and interviews with past advisors of the program. To better understand WOW and its goals, we'll take you on a little trip back in time. Way back in 1901, when Cal Poly was founded, the school's orientation program was nothing like it is today. Over the years, it has grown and changed. In 1957, the term "Welcome Week" was coined. It started as a leadership training camp for student leaders. The student leaders were from clubs, Associated Student Body, and student centers all over campus. These students were the original WOW leaders. As enrollment grew at Cal Poly, the orientation of new students expanded. New students were organized into 25 to 30 WOW Clubs of about 29 new students and four counselors. Each club had its own nickname and theme. The Welcome Week booth was located in a variety of places during the next few years, including the Administration Building Lawn and at what is now Mott Lawn. The booth had a PA system to play records and music, and they served refreshments to new students that stopped by. Half of Welcome Week was spent in SLO learning about campus resources, going on campus tours, and visiting San Luis Obispo itself on tour buses. New students could also attend dances and "mixers" throughout The Week, some of which were held in the Men's Gym (now called Mott Gym) and Crandall Gym. The other half of Welcome Week was spent at a 2-day "Welcome Round-Up Camp" at Camp Pinecrest and Camp Ocean Pines (where TEAM retreat is currently held) in Cambria. The camp included panel discussions, dances, ping-pong, volleyball, baseball, church services, speakers from campus, group question and answer sessions, the annual "Hootenanny," and a treasure hunt to acquaint new students with campus policies, rules and functions. WOW training meetings were set at 7 p.m. on Tuesday nights. These meetings included stuffing new student folders. This is still our traditional meeting time and night during Spring Quarter. Counselors (now called Orientation Leaders) were required to have a minimum 2.0 GPA. Today, additional requirements are in place. New students and counselors were obligated to wear "Rooters Caps" which became a tradition for many decades. Today, you can identify an Orientation Leader by the bright shirts they wear during The Week. Their version of Campus Knowledge was a 75-question quiz given to new students. At the end of The Week, prizes were given to the top students who answered the quiz correctly. In 1961 it was suggested that the WOW Clubs only have two counselors per group, and the extras became the first ever Event Staff members. We still maintain two leaders per group. WOW is all about traditions and the history that makes it up. To move forward, we should remember the past and the roots the programs come from. The Week of Welcome Orientation students and staff have proven the excellence of this program on many occasions. Below is a list of awards we've won over the years. 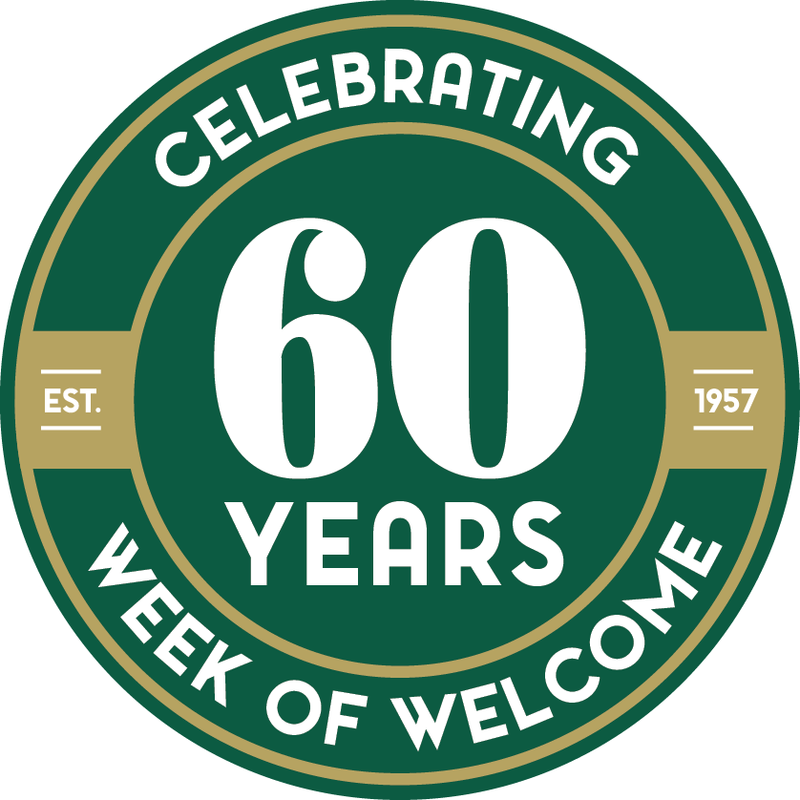 The Friends of WOW (FOW) are alumni, family and supporters of the Cal Poly Week of Welcome program. Being part of these groups keeps the FOW involved with the program and updated with the latest developments of the orientation program. The group's email address is friendsofwow@googlegroups.com (be aware that messages sent to this address will be sent to ALL members of the group). Join the group, remind your FOW friends to sign up too, and keep in touch!